TMS: Track practice tomorrow. 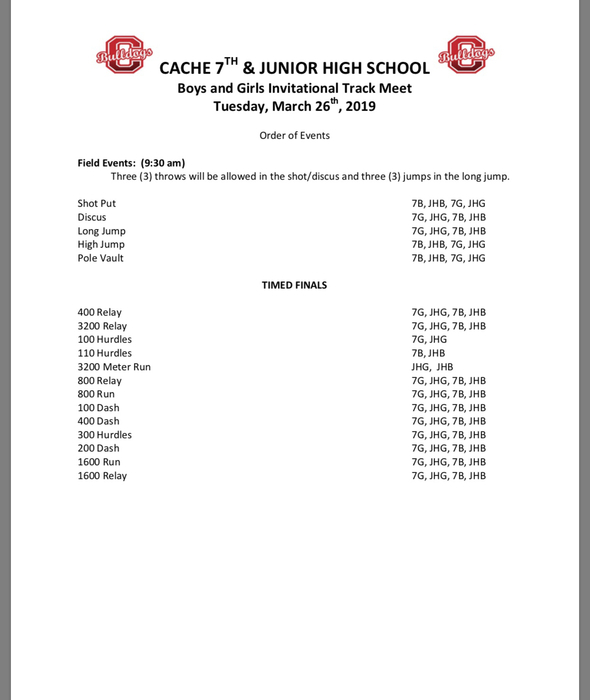 Track meet at Cache on Tuesday. Track bus leaves TMS @8:15 am Tuesday morning. The track bus will leave TMS at 8:15 AM for the Duncan Track Meet. Show up dressed in your track uniform. TMS parent-teacher conferences are scheduled for March 26 and 28, from 4-7pm. Please call and schedule a conference with your child’s grade level counselor at (580) 585-6416. We look forward to seeing you soon! TMS: No baseball practice or game today. The Duncan track meet is cancelled for Tuesday, March 12. If weather permits, it has been rescheduled for Wednesday, March 13. 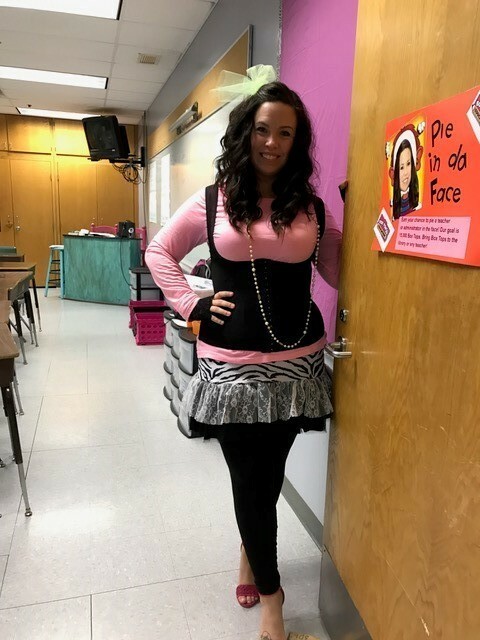 TMS students have earned a free dress day on Monday, March 11. Please make sure your child is following the LPS dress code. No holes above the knee and no sleeveless or low cut shirts. TMS: Today’s baseball game has been rescheduled for April 23. TMS: Please be aware that tomorrow’s forecast calls for wind chills around 0° in the morning. If your child has to be at a bus stop or walks to school, please ensure they are properly clothed! Correction: Tennis practice is after school and will be done at 4:00. Also, Track athletes shirt order money($15) is due tomorrow by 10 am. Turn in orders forms and money to Mrs. Knutson. TMS tennis will start tomorrow, Monday, March 4 at 4:00 in the small gym. TMS Parents: Please call the school by 8:30am if your child will be out for the day. 8th grade parents. Please join us tonight for the LHS Parent Meeting about pre-enrollment from 6-7 in the Commons Area. 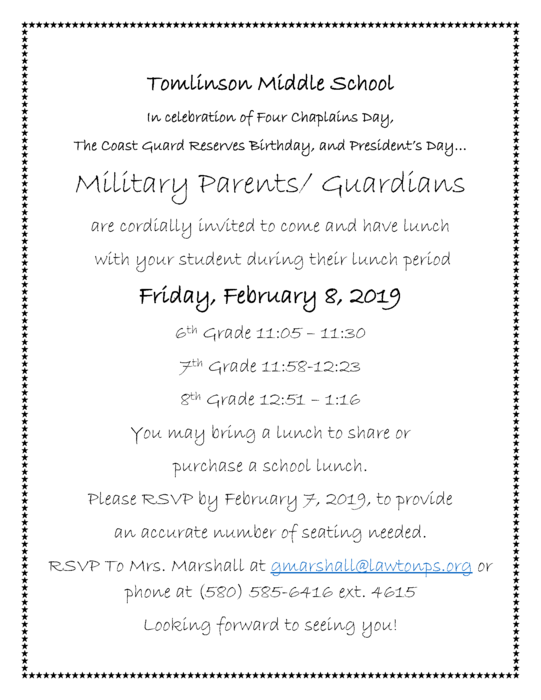 TMS Military parents- please see attached information about parent lunch. TMS parents please make sure your students have necessary supplies (paper, pencil, etc) for this semester. Supplies can be purchased in the library. 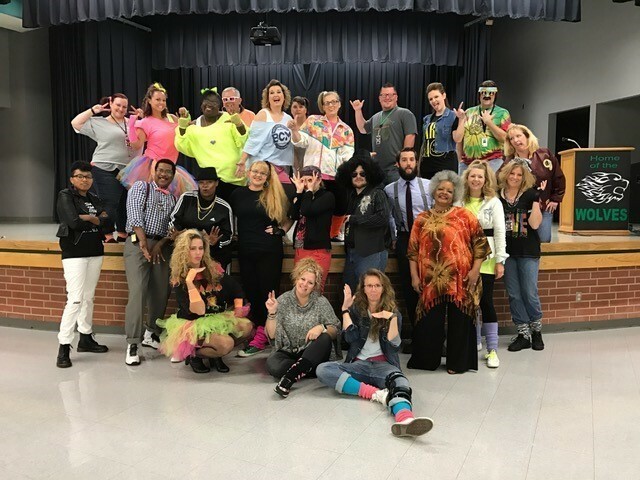 TMS 8th grade parents. Please see information about LHS Pre-Enrollment. TMS Parents, please make sure that your student has their student ID daily. Tomorrow, Jan.9 @8:30am is Coffee With Counselors. We will discuss your students benchmark results and how to prepare for success this semester. Join us for coffee and snacks in the library! TMS 6th grade boys and girls basketball games will start at 4:00 today at CMS. TMS: 6th grade basketball @CMS, boys at 4:00 and girls at 5:15. 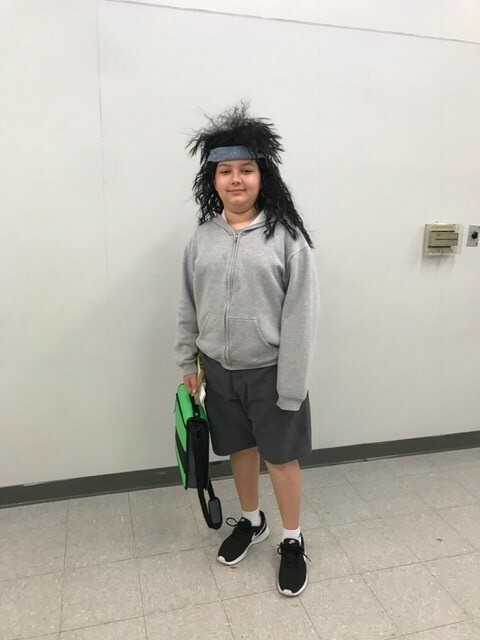 TMS parents: students are allowed to wear crazy socks, hair and shoes tomorrow. Regular uniform clothing is required. No jeans or pajama pants please. TMS: 6th grade girls basketball will practice tomorrow morning at 6:30 in the small gym. TMS parents: due to your overwhelming support, all available conference times for tonight and tomorrow night have been filled; walk-ins will not be possible. Please call the school to schedule an appt for after Fall Break. Tomorrow is Pink Out day. Wear as much pink as you can, but please no hats or wigs. 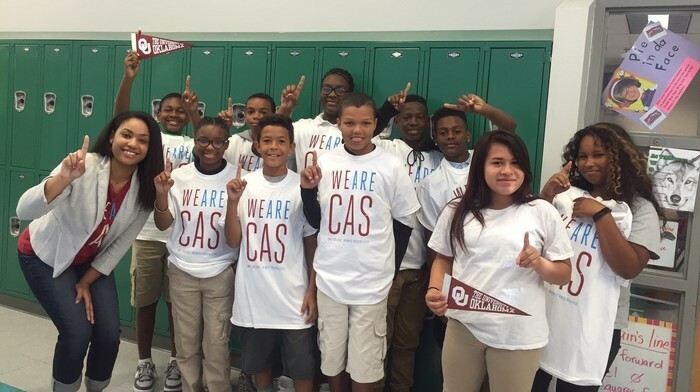 TMS parents: if students wear hoodies to school, it is mandatory that they be solid color with no logos or designs. TMS: correction to the previous message. 6th grade football game today is at Ron Stevens NOT Cameron. We apologize for the confusion. TMS: 6th grade football game is at Cameron today not Ron Stevens. TMS Parents: all football games scheduled for today have been cancelled. TMS parents: parent/teacher conferences are next week 10/15 & 10/16. Please call your child’s grades level counselor to make an appointment. TMS: The Book Fair closes tomorrow after lunch so please make purchases before then. Also, student ID’s must be worn to school each and every day. This is not optional. Thank you! TMS 6th grade football game has been cancelled for tomorrow. TMS Parents: Wrestling meeting tonight 6:30 @ LHS for anyone interested in wrestling. 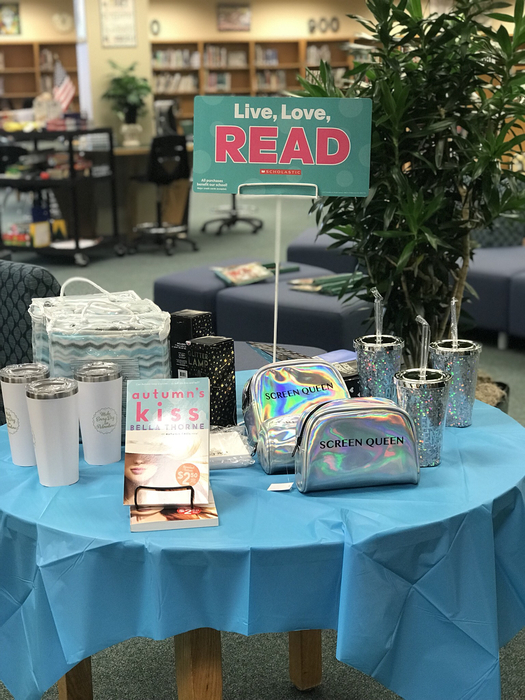 TMS Book Fair opens tomorrow and continues through Oct.5. Lots of great items! Parent Night Oct.2. FREE pizza and drinks @ 5:45. Hope to see you there! TMS parents: please remember all hoodies and jackets worn at school must be solid color. Thank you for your help. TMS Parents: Progress Reports went home today. Please ask your child about their report. TMS Tailgate Party Tues., Sept.25 @ 2:00 pm. Students may wear joggers or jeans (no holes above knee) with their Game On shirt. TMS Picture Day is Monday 9/17. Uniforms are required. PTSA shirts will be sold today at lunch for $10. 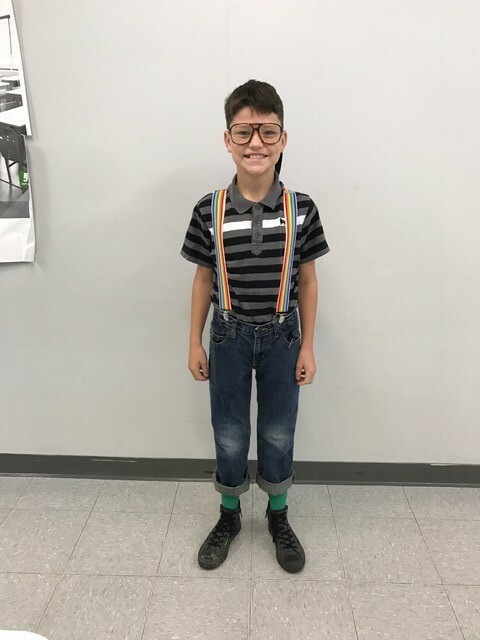 TMS picture day Monday, 9/17. Dress code is enforced. TMS Parents: Student ID’s are mandatory at school each day and also to get into after school sporting events. Replacement ID’s can be purchased at school for $5. TMS parents: Join us for Coffee with Counselors on Mon., Sept. 10 from 7:30-8:30. 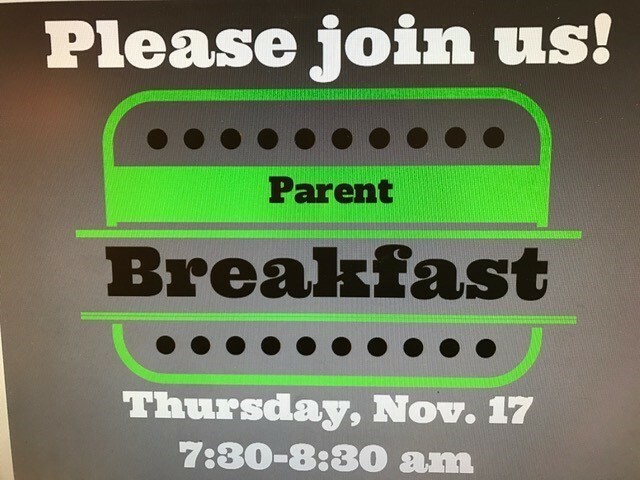 We will have coffee, snacks, and info about Parent Portal. TMS parents- if your child has not paid the $20 iPad fee or turned in the signed contract we encourage you to do so by Wed., 9/5. No school for LPS tomorrow, 8/31, and Monday, 9/3. School will resume on Tuesday, 9/4. Have a safe Labor Day weekend! TMS parents: today’s football games will be held at Cameron Stadium. Due to circumstances beyond our control, the 8th grade football game will be played at 5:00. There will be a 7th/8th jv scrimmage at 6:15. TMS Parents: if your child’s iPad contract or $20 user fee has not been paid, your child will bring a notice home today. Both items must be taken care of before they can receive an iPad. TMS parents: we hope to see you at Open House tonight @ 6pm! TMS parents: don’t forget about Open House tomorrow evening, 8/21, @ 6pm. We hope to see you there! TMS Parents: for safety purposes students are required to wear ID’s daily. If ID’s are lost,replacements are $5. Lanyards cost $1 and protective badge holders cost $1. TMS Parents: please like our Facebook pages: TMSwolvesLawton and PTSA page Tomlinson Middle School PTSA to stay connected! TMS family: we look forward to seeing all of our students tomorrow! Modified dress code is required. Doors open @ 7:55 for breakfast. We are excited about the new year! TMS Parents: It is mandatory that you complete the necessary paperwork for your child prior to school starting on 8/10. TMS 7th grade students check-in tomorrow, Aug. 2 from 8-11:15. Remember to bring immunization record and $20 iPad fee. TMS- tomorrow is 8th grade check-in from 8-11:30. Remember to bring $20 iPad fee & address verification if you have moved or are new to TMS. TMS parents- for security measures, please bring a state issued ID card (such as drivers license) to student check-in this week. Military ID’s are not accepted. TMS student check-in dates: Aug.1st -8th grade, Aug. 2nd -7th grade, Aug. 3rd- 6th grade. 8:00-11:30 for all days. Parent/guardians must be present during check-in. Reminder: ALL incoming 7th grade students must have the Tdap shot prior to Aug. check-in. Before Aug. check-in, all incoming 7th grade students must have Tdap shot. Students CANNOT pick up new schedule or attend school without this immunization. TMS 8th graders who bought 8th grade shirts are encouraged to wear them on Wednesday! TMS students are encouraged to wear red or blue tomorrow as part of our “Super Hero Send Off” for Special Olympics. Dress code is still in effect. Last call for TMS yearbook release party! Students must have yearbooks paid in full by end of lunch tomorrow (5/15) to receive invitation to VIP party! Pre-order a yearbook in the office for $50. Students who pre-order will receive an invitation to an exclusive VIP release and signing party. Don't miss out! TMS 8th graders- OK Promise applications are due to Ms.Gilbert by Fri., April 27! For questions, call Ms.Gilbert @ 580-215-0255 Ext.4614. New school hours take effect tomorrow. Breakfast starts at 7:30. School hours are 8:00-3:45. Buses pick up 30 min early. Due to district technical issues TMS will not give the OSTP 8th grade writing test tomorrow Tuesday Apr 17th. TMS reminder- students can login to Study Island, Reading Plus and USA Test Prep from home! All students know how to log in. TMS students can log on to USA test prep, Study Island, and Reading Plus. Some teachers have created assignments to help with testing review. TMS will have breakfast and lunch during the work stoppage. Breakfast is from 8:00 to 9:00 and lunch is from 11:30 to 12:30. TMS parents: parent conferences are this week 3/27 and 3/29 from 4:00-7:00. 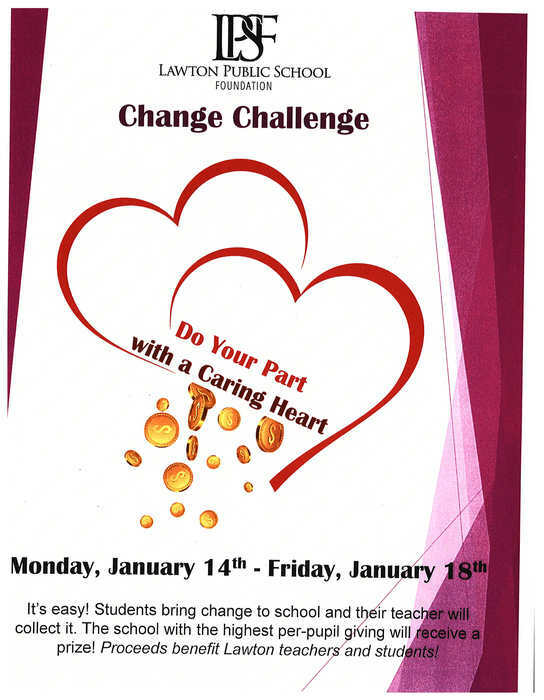 Please call your child’s counselor to schedule an appointment. TMS Academic Awards and Art Show Thurs.,3/8 @ 6PM TMS Commons Area. Students received prior notification for awards. Today's 8th grade baseball game in Fredrick has been cancelled. All TMS after school activities are cancelled this evening. STEM Night has been cancelled for tonight. It has been rescheduled for Feb. 27 @ 5:30. TMS Reminder: All Valentine gifts brought to school tomorrow must be check in at the main office and students will pick up at the end of the day. Thank you! 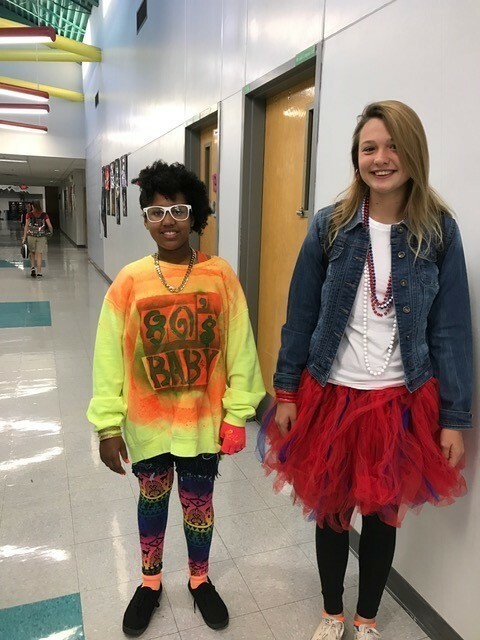 TMS students may wear jeans/athletic pants (no holes above the knee) on Fri., 2/1 for $2. Proceeds benefit Special Olympics. TMS reminder: the building & gyms will be closed completely until Monday morning. Absolutely no one will be allowed in those buildings until Monday morning. Lawton Public Schools has made the decision to cancel classes for Friday, Jan. 26 due to the number of absences and illness. This includes staff and students. TMS students will be participating in a tornado and fire drill this afternoon. This is only a drill. TMS 8th graders: OKC Dodgers game field trip on May 7. Money due by March 16th. All details and guidelines have been explained in a letter sent home with the permission slip. Thank you! Pre-enrollment for TMS 8th graders entering 9th grade at LHS is 1/18 at 6pm @ LHS. If you missed the first date please try to make this one. TMS students are bringing home report cards today. Please ask your child to see his/her report card. Pre-enrollment for TMS 8th graders entering 9th grade at LHS is 1/18 at 6pm at LHS. If you missed the first date please try to make this one. TMS group pictures tomorrow. Students in groups, clubs or sports need to bring their team/club shirt. 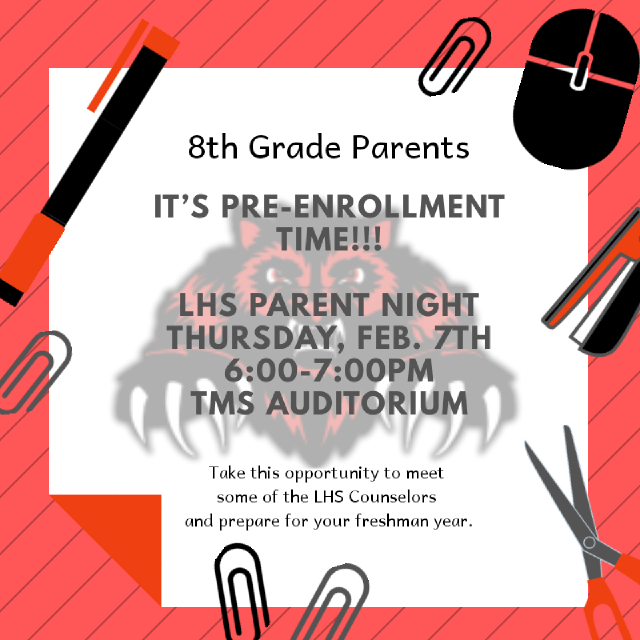 TMS Reminder:8th grade parent meeting for LHS pre-enrollment tonight 6pm @LHS auditorium. TMS reminder: Mandatory 8th grade parent meeting on 1/9/2018 at LHS auditorium @ 6pm for pre-enrollment. You should have received a letter prior to the holiday break. TMS Dollars for Denim $2 on Wed. 12/20! Students may wear athletic pants or jeans with no holes above the knees. Students wanting to donate non-perishable food have one last chance. All items will be delivered to the Lawton Food Bank TOMORROW morning. TMS canned food drive starts tomorrow! Bring items to stage area in the morning. TMS Holiday friendly pics will be taken 12/6-12/8 during lunch. Cost is $1 per student in the picture. TMS canned food drive Dec.8-15. Items will be collected in the commons area. Please join us for our annual TMS Choir Winter Concert on Dec.5 @6pm in the commons area. Happy Thanksgiving to our TMS families! TMS Dollars for Denim! Students may pay $2 tomorrow to wear jeans or athletic pants. No leggings or holes in jeans above the knee. TMS Dollars for Denim! Students may pay $2 on 11/21 to wear jeans or athletic pants. No leggings or holes in jeans above the knee. A huge thank you goes out to all of our TMS parents for your support in helping to pass the LPS bond. Total teamwork! 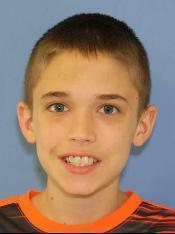 TMS picture retakes are 11/16. 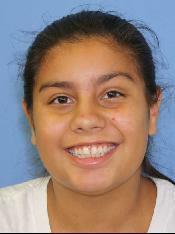 If your child had an issue with the previous picutre or if they were absent they may retake their picture. If your child took orders for the TMS all school fundraiser, the items will be in tomorrow and can be picked up between 9:30am and 3:30pm. If your child took orders for the all school fundraiser, the items will be in on Tuesday and can be picked up between 9:30am and 3:30pm. TMS 8th grade students who have Hanson, Harrison, McLaughlin 1st period must turn in permission slips for Cameron Field trip by tomorrow. This group 1 field trip is 11/13 9am-1pm. If you missed our first parent meeting regarding the upcoming bond election on Nov. 14, please join us on Thurs.,Nov.9 @ 3:45 in the library for our final meeting. Don't forget to order your TMS spirit wear at http://shop.fancloth.com/73505/313508. These would make great Christmas gifts. Order deadline is this Fri.,Nov.3! 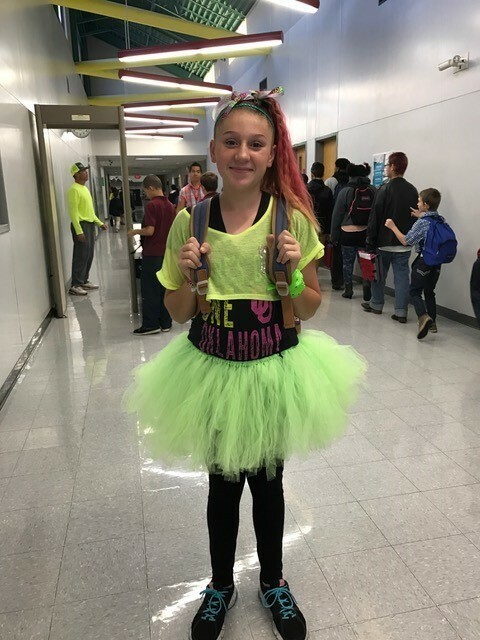 TMS modified dress code is in effect today. Halloween costumes are not allowed. All TMS Red Ribbon activities scheduled for the remainder of the week are cancelled. Don’t forget to sign your child’s Federal Aid card and have them return it to school today! Correction to previous message: Impact Aid cards will be sent home on Tuesday, Oct.24 and need to be returned on Wednesday, Oct.25. Thank you. Your child will be bringing home a Federal Impact Aid card today which needs to be signed and returned by tomorrow 10/24. This card is vital to our school funding. 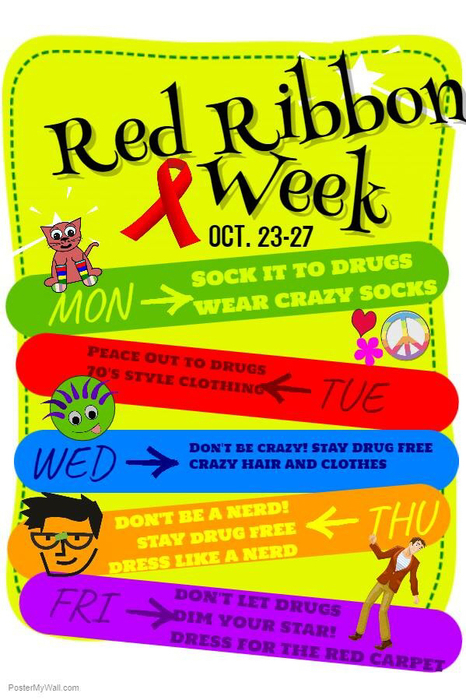 TMS Red Ribbon week Oct.23-27! There will be no 6th grade football game tomorrow 7th will start at 4:30 with 8th grade to follow. Eat out tonight and earn money for TMS! There is NO school for LPS students Fri. (10/13).Classes will be held the following Mon. & Tues.(10/16,10/17)followed by Fall Break (10/18-10/22).Classes resume after Fall break on Mon.(10/23). Support TMS Athletics by shopping online at https://shop.fancloth.com/73505/313508. Sale ends Nov.3. All items delivered by Christmas! 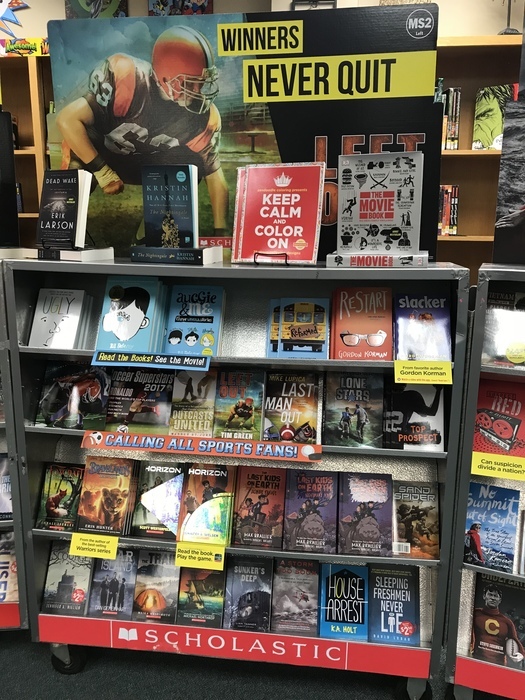 TMS parents: the Book Fair will close tomorrow at 1:00. TMS parents: parent/teacher conferences are Oct. 16 and 17 from 4-7 pm. Please call the counselor’s office, 580-585-6416, to schedule a conference with your child’s teachers. A huge thank you goes out to all of our TMS families who attended Family Night this evening. It was great to see so many families in attendance! 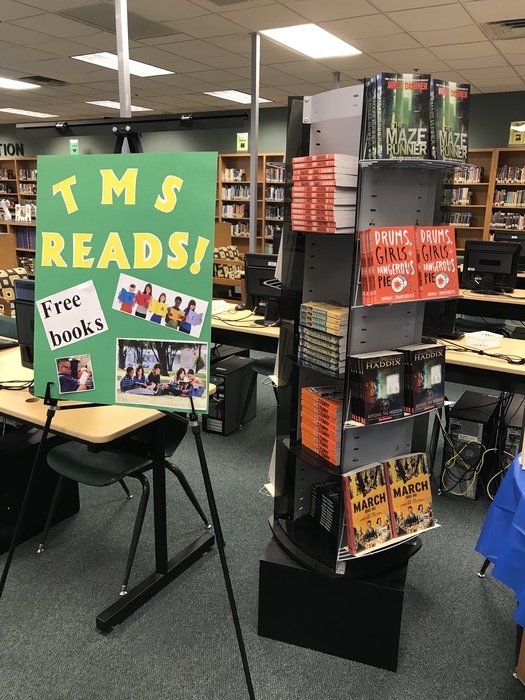 Free books and pizza tonight @ TMS! Parent meeting @ 5:45. Hope to see you! TMS families: We hope to see you tonight for family night starting @ 5:45 in commons area. Bond proposal info, Book Fair night, FREE pizza/drinks & FREE books! TMS students interesred in joning Art Club need to come to room 803 to pick up a permission slip this week. Meeting is Oct.6 @ 3:15. Reminder: tomorrow evening 5:45 IMPORTANT parent meeting regarding upcoming school bond proposal. Book Fair family night FREE books! Free pizza and soda served. TMS parents- if you have not paid your child’s $20 iPad fee please do so this week. TMS student progess reports will go home with students today. 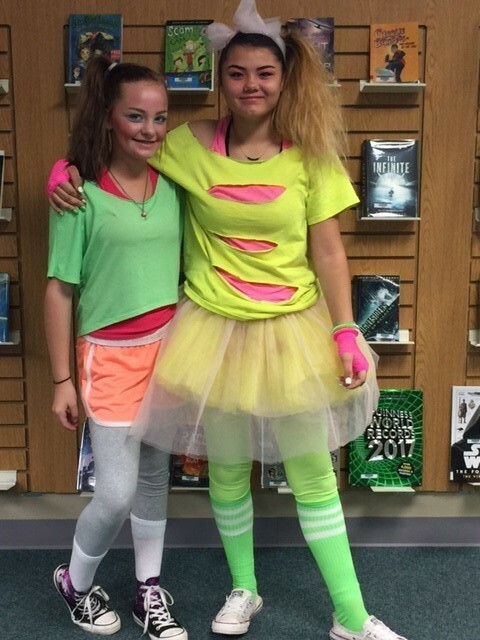 TMS Book Fair family night 10/3 open until 7pm in the library. Lots of great gift ideas! TMS parents please join us for an important parent meeting regarding the upcoming Student Investment Program(SIP) bond proposal on 10/3 @ 6pm in commons area. TMS parents: voter registration forms are available in the main office! The deadline to register to vote in the upcoming bond election is Oct.20. FCA kicks off this morning with the annual “See You at the Pole” event @ 8am in the choir room. All students are welcome! TMS Parents: Due to the rain the football games scheduled for today 9/26 have been cancelled. Thank you. CORRECTION TO THE NEWSLETTER: WE DO HAVE SCHOOL OCTOBER 16-17, WE DO NOT HAVE SCHOOL OCT 18-20. TMS Academic Awards tonight @ 6pm. You were notified by mail if your child is receiving an award. We are looking forward to this evening! April 3, 4-8pm Texas Roadhouse night. 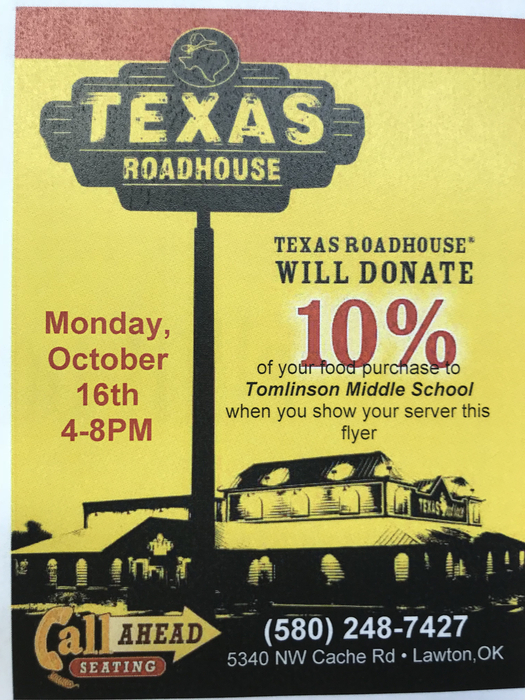 10% of your bill goes to support TMS PTSA! TMS Academic Awards program on 4/4/2017 @ 6pm in commons area. A letter will arrive in the mail informing you if your child is receiving an award. Congratulations to our Red Ribbon door contest winners~ Dr. Thomas, Ms. Nicholls, and Ms. Williams! 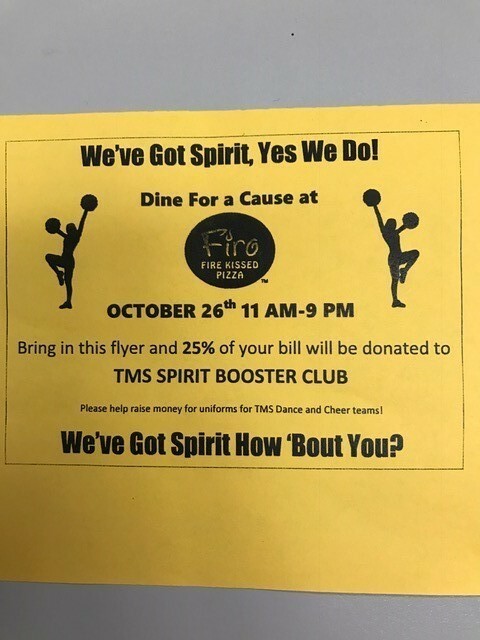 Support the TMS Spirit Club tonight @ Firo Pizza! Show this flyer and 25% of your bill will be donated to TMS Spirit Club. Achieve your dreams! Wear your favorite school appropriate pajamas or sweats tomorrow 10/27! 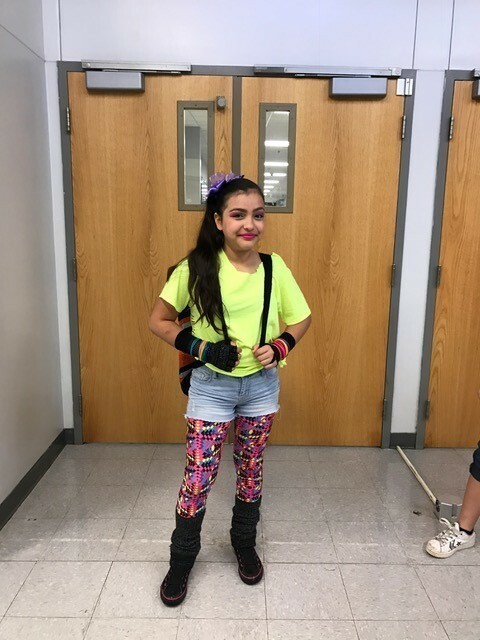 Crazy 80's day @TMS today! Mrs. 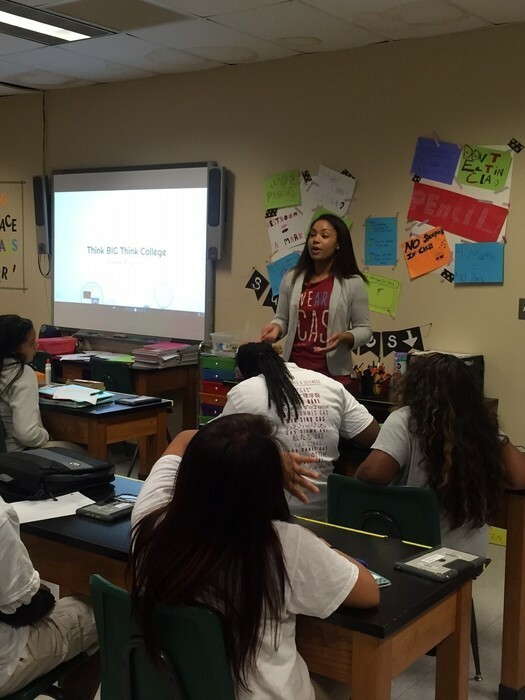 Rain's 7th graders learn from OU Junior, Taylor Calvert, about college prep! LHS vs. MHS football tickets on sale in the main office! $5 students (in advance) $7 adults.